I just overheard a new co-op say “I just feel so insecure.” It made me giggle. 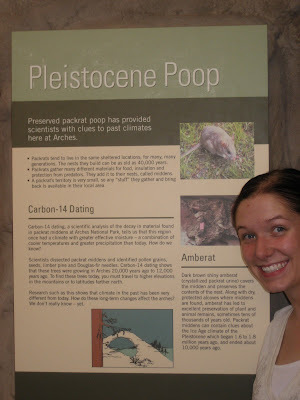 Moving on to the real reason for this post – vacation! A few months ago Jen and I were talking to our friend and coworker about his sail boat he keeps in L.A. We somehow convinced him he should take us on a boat trip. We picked a date in May and started planning for our ideal adventure. As May came closer and closer, Jared, our friend started warning us the trip might not happen, the boat was in need of some repairs before we could go on a trip. We told him to get to work and get that ship in shape in time for our trip – he promised! Meanwhile Jen and I worked on a backup plan. Neither one of us had been to Great Basin and Jen wants to visit all the national parks out here before she moves back home. We began planning. Jen called the ranger to be sure things would be open for us when we were there. We were planning a long weekend so we needed enough stuff to do for 3 days. When Jen outright asked the ranger if we would have enough stuff to do in the park for 3 days the ranger didn’t even hesitate in saying no. Crap. Time for a backup plan for the backup plan. 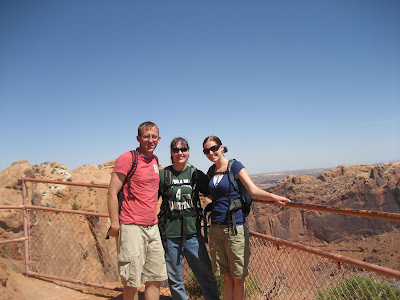 We finally settled on Moab for a few reasons, it is warm there and we could go to two national parks. Excellent. 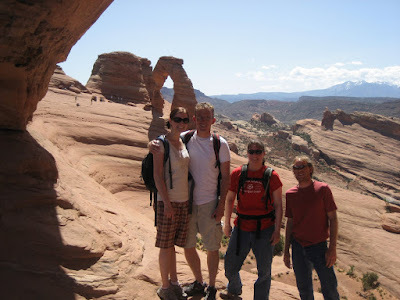 Jen, Jared, Shad and I left for Moab last Thursday night. After dropping Dublin off at my parents we were on our way. After only a few hours into the trip we started our adventure. While driving on I-6, a deer ran out onto the road and hit our car. I say hit our car because it literally ran into the side of the car, I didn’t hit it. After walking to the nearest mile marker and calling highway patrol, we were on our way. Poor Rex has some dents that will get fixed this week but everyone was fine (minus the dead deer) and we had a good laugh. 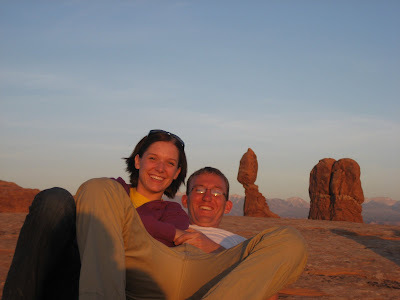 The next morning we headed into Arches National park. 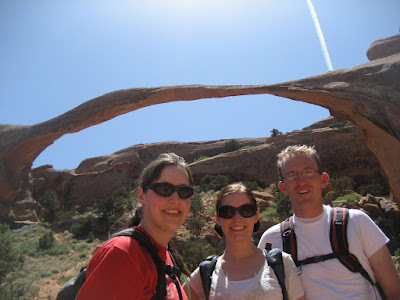 We started off with the Delicate Arch hike since I had never done it. Here are a few pictures. 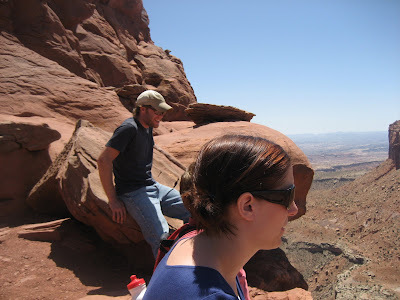 During lunch at Delicate Arch, someone (not someone in our group) lost a water bottle over the edge of the cliff. Jared being very concerned about the environment went to the edge of the cliff to see where it was. The next thing we knew, Jared was over the edge after said bottle. Meanwhile an older couple next to us got really concerned. We reassured them he had his ID in his pocket so they could ID him when they found his body(I’m not kidding – those were our exact words). A few minutes later, Jared returned to our ledge triumphant with the bottle. Then the real fun began. The man from the elderly couple insisted the group give him a round of applause then asked Jared what he did for a living. When Jared responded he was an engineer, the old man was so disappointed and said “that’s too bad; I could use a nimble man like you to work at my steel mill. Mmm.” That’s right. An old man hit on Jared by calling him nimble and offering him a job in his steel mill in front of his wife. He also called him Jerry instead of Jared. If you’re a nimble good looking young man, I have some job hook ups in the steel industry apparently. 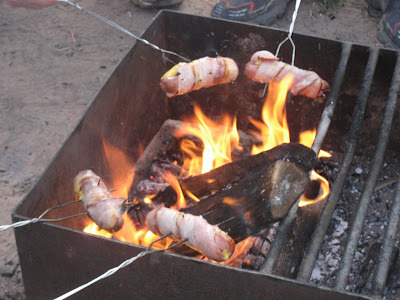 We went on a few more hikes then came back to camp and made bacon wrapped cheese stuffed hot dogs. So delicious. The next day was mystery day. We put the boys in charge of this day. 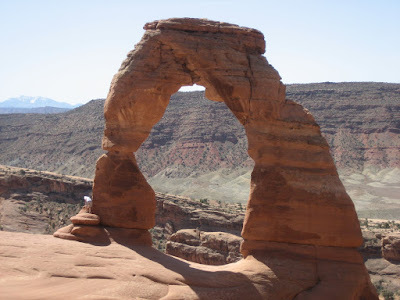 They gave us the option of doing the Firey Furnace in Arches (this requires a special pass you have to get the day before) or going Jeeping. I wasn’t sure why Jeeping was even an option – Shad has told me on several occasions off roading makes him sick. I voted for the hike so off we went. The hike started off fine, there aren’t any trails in that area of the park, so you’re kind of on your own. We wandered for a bit then the boys climbed up some rocks leaving us in a hole, with no way to climb out. Stupid boys taking for granted their upper arm strength. Here’s a picture of us in the hole. We were actually really mad though none of the pictures showed it. 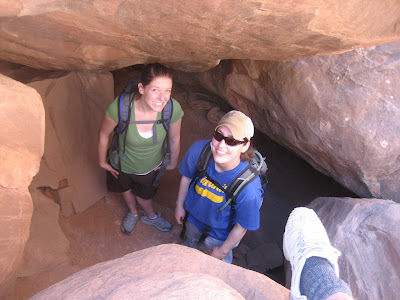 After that, we reminded them that they had girls with them and they could scale rock walls to their hearts content, they just couldn’t expect us to follow. 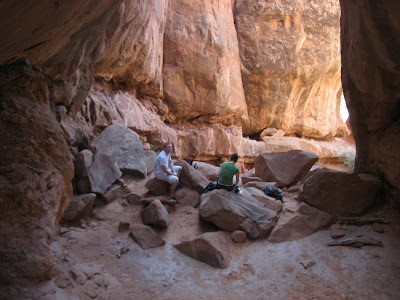 We enjoyed lunch in a cave we found the headed back to Moab. It was a pretty toasty weekend in Moab so we headed to the public swimming pool for an afternoon of cool water. It felt really good. After that we went out to eat at a Mexican restaurant. 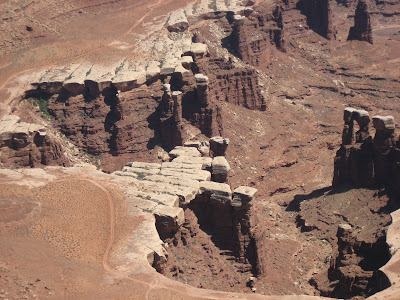 Sunday we spent the day in Canyonlands hiking. The ranger there suggested we do a bunch of little hikes to see the diversity of the park. That is exactly what we did. 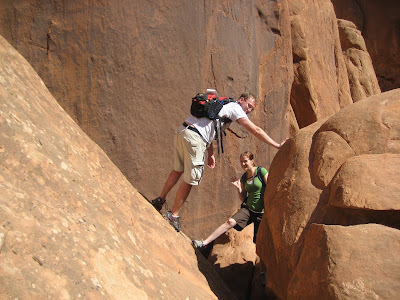 It was another good day of hiking though I was a little sore from scaling rock walls with the boys the day before. 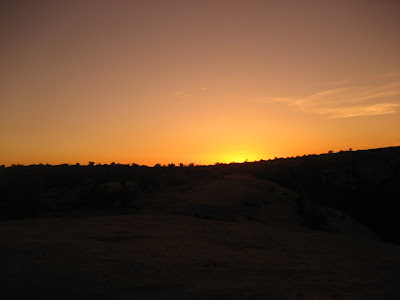 We went back to camp and made some tin foil dinners then went back to Arches to enjoy the sunset and get ice cream after. It was a great night to end our trip with. P.S.- the security word for my last comment was "mater". I always get the best words on your blog!